My name is Anastasia Jane Stowe I was born in Karaganda, Kazakhstan 18 years ago. My biological mother has a mental illness and she couldn’t take care of me. So they took me away and put me in an orphanage. I want to know about Kazakhstan because I have no idea what it was like and I would like to learn more about my culture. This is what I learned. Kazakhstan officially known as the Republic of Kazakhstan is a transcontinental country located in Central Asia and Eastern Europe. It is the world’s largest land-locked country and also ranks as the ninth largest country in the world. It is divided into 14 provinces and the provinces are sub divided into districts. The Capital is Astana but the largest city is Almaty which was the capital until 1997. For most of its history Kazakhstan has been inhabited by nomadic tribes.. In 1936 Kazakhstan became the Kazakh Soviet Socialist Republic and an official part of the United Soviets Socialist Republic. In the 20th century many Soviet projects took place in Kazakhstan, it was the primary nuclear testing site. On December 16, 1991, almost exactly one year before I was born, Kazakhstan declared itself an independent country. It was the last Republic of the Soviet Union to do this. It is now considered to be the dominant State in central Asia. Kazakhstan has a wide variety of ethnical and cultural groups mostly due to the mass deportation of these groups from other parts of the Soviet Union during Stalin’s rule. It has some 131 different ethnic groups and its population is 16.2 million. It is a bilingual country with Kazakh being the State language and Russian being the official language and spoken by most Kazakhs. Kazakhstan has been inhabited since the Neolithic Age. The regions climate is best suited to the nomads practicing pastoralism. It is thought that the horse was first domesticated in this area. In the 1890s the number of Russians settlers increased due to the building of the Trans/ Aral rail way and the creation of the Migration Department in St. Petersburg. During the 19th century some 400,000 Russians immigrated to Kazakhstan and during the first part of the 20th century one million others nationalities immigrated. This caused the Kazakhs and the new comers to argue over land and water. There was a brief time after the fall of the Russian Empire that Kazakhstan was left alone. But by 1920 the Kazakhs had come under the Soviet Union’s rule. The forcing of the Soviet policy of its collectivization and the elimination if the traditional life style of the Kazakh people brought about mass hunger. Between 1926 and 1939 the Kazakh population declined by 22% due to starvation and mass emigration. During the 1930s under Stallion’s order many renowned Kazakh writers, thinkers, poets, politicians and historians were put to death to repress the Kazakh identity and culture. In 1936 Kazakhstan became a Soviet Republic. Many people because of their Ethnic heritage or beliefs were taken to Siberia or Kazakhstan in placed in Soviet labor camps causing another large population growth. World War II saw industrialization increase mineral mining in support of the war effort. There were 5 national divisions of Kazakh solders sent to defend the Soviet Union during this time. In 1947 shortly after the war the USSR’s main nuclear weapons testing site was founded near the city of Semey, Kazakhstan. Ecological and biological effects happens felt for generations in this area because of the testing of a nuclear bomb in 1949. In1953 Khrushchev started the “Virgin Lands” program turning pasture lands in Kazakhstan into grain producing lands. Today agriculture is the largest part of the Kazakh lively hood. Kazakhstan declared its right to rule itself in October in 1990. With the dissolution of the Soviet Union, Kazakhstan declared Independence on December 16th 1991. It was the last of the Soviet Republics to declare Independence. Kazakhstan is a presidential Republic with the president also being commander in chief of the armed forces. Nursultan nazarbayed is the country’s president, and has been since before its split with the Soviet Republics. He has received life time power and privileges from Kazakhstan’s parliament into 2007. This is why democracy has not been affective. Kazakhstan has an large agricultural economy with it being the second largest producer of grain in the world. The countries major crops include wheat, barley, cotton and rise. Another important agriculture product is livestock. The main live stock products are dairy products, leather, meat, and wool. Kazakhstan is thought to be one of the origins of the apple. The region where it is thought to start is called Almaty which means “rich with apple.” Because of poor management during the Soviet rule agriculture in Kazakhstan has many environmental problems. Kazakhstan has many accessible mineral and fossil fuel resources with the development of petroleum of natural gas, and mineral extraction Kazakhstan has seen large for investments. Some people believe Kazakhstan has the second largest uranium, chromium, lead and zinks reserves, the third largest manganese reserves the fifth largest reserves and ranks in the top ten coals, iron and gold. Kazakhstan also currently has the eleventh largest proven reserves of both oil and natural gas which is the most important factor for economic development. The testament of Kazakhstan’s oil deposits is over 6 billion tons. 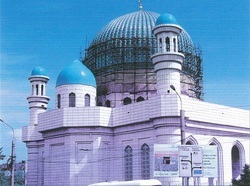 The largest religious group in Kazakhstan is Islam with a majority of the Muslims of being Sunni. One fourth of the population is Russian orthodox Christian. The Russian orthodox Christmas is a national holiday. There are other Christian groups including Roman Catholics and Prodestants and other religious groups including Judaism the Baha’i Faith, Hinduism, Buddhists, and the Church of Jesus Christ of latter/day Saints. With political Independence came religious Independence. Many people are now expressing ethnic identity through their religion. Education is Universal and mandatory through to the secondary level and the adult literacy rate is 99.5%. There are three main educational phases’ parts. There is primary education”1-4”, basic general education “5-9” and senior level education “10-12”. There are also Universities Academies and institutes available for higher learning. The Kazakhs had a highly developed based on their nomadic pastoral economy before the Russians tried to colonize. Traditional Kazakh belief was that separate spirits inhabited an animated the earth, sky, water and fire as well as domestic animals. Even in today’s society some honored guests are treated to a fest of freshly killed lamb. Besides lamb many other traditional foods contain symbolic value in Kazakh culture. With live stock being so important to the Kazakh style most of their nomadic costumes relate in some ways to livestock. Kazakhs have historically passionate about horseback riding, this continues even today. In the early 21 century, Kazakhstan has become one of the leading nation’s international adoptions. Due to concerns about safety and treatment of the children adopted abrod criticisin has been voiced imparliament. I personally feel that I am better off adopted than I was in the orphanage. In the orphanage I was classed as unteachable because of the fact my biological mother had a mental illness. I would have been placed in a mental institution for the rest of my life when I turned 4, had I not been adopted. I think this is part of the old Soviet ways and hope that the new Kazakhstan is changing this. I am glad that I researched Kazakhstan. I can see that there is more history in Kazakhstan than there is in United States because people have been their longer. The Kazakh people have a rich history; they have a nomadic culture mixed with all the nationalities that have touched them. I hoped to someday experience this culture.